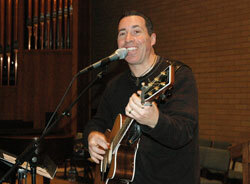 “Have guitar—will travel and evangelize” could be internationally known Catholic musician, composer and storyteller Steve Angrisano’s motto. “Live: Songs from the Road,” “Welcome Home,” “Set Free,” “Live It,” “You Are the Way” and “Make a Difference” are among his high-energy Christian music CDs. Faith, family and music are so closely intertwined in Angrisano’s life that he lives his calling from God as a parent, youth minister and music minister every day. His wife, Jenni, and their three children—Julia, Joshua and Joseph—often travel with him from their home in Highlands Ranch, Colo., to weekend youth ministry conferences in other states. They pray as a family every day and often sing together. Angrisano is the keynote presenter for “Infinite,” the 2008 Archdiocesan High School Youth Rally on March 2 at Bishop Chatard High School in Indianapolis. He will also present a Lenten reflection and renewal concert which is open to the public at 7 p.m. on Feb. 29 at St. Jude Parish, 5353 McFarland Road, in Indianapolis. Angrisano has many Catholic friends in the archdiocese that he met while serving as the keynote presenter for several archdiocesan youth conferences and parish missions as well as the National Catholic Youth Conference (NCYC) held in Indianapolis in 2001. In recent years, he also has presented youth and young adult ministry programs at Marian College and St. Matthew the Apostle Parish in Indianapolis. Young Catholics from many countries have heard him sing during World Youth Day concerts in Rome in 2000 and Germany in 2006. He will also present a concert during World Youth Day in Sydney, Australia, in July. Angrisano is known for his unique blend of laughter, songs, stories and humorous audience interaction skits that have earned him four NCYC concert invitations and keynote presentations at hundreds of diocesan youth rallies since he began his ministry 11 years ago. Father Jonathan Meyer, director of youth ministry for the archdiocese, said Angrisano composed the music for the closing song, “Go Make a Difference,” sung at NCYC in Indianapolis six years ago. Angrisano shares compelling stories about his faith and family during youth ministry presentations. As part of his testimony, he occasionally mentions some of his experiences ministering to Columbine High School students in Littleton, Colo., after two boys with guns killed a teacher and 12 teenagers, wounded dozens of other teens then killed themselves on April 20, 1999. 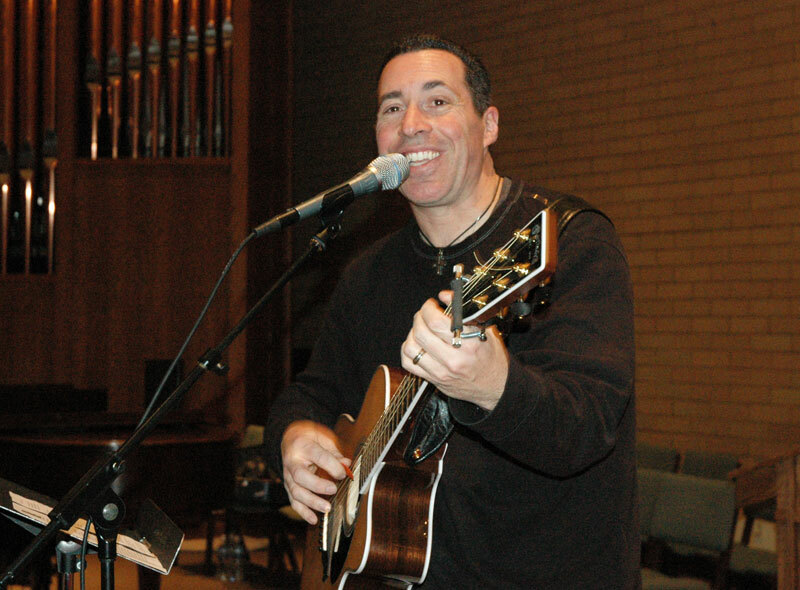 Angrisano started playing the guitar and singing during Mass at his parish church when he was 12 years old, and as a young adult realized that God was calling him to youth ministry and music ministry. Five hundred high school students are expected to participate in the youth rally this weekend, Father Meyer said, and Angrisano will help lead them in reflections on God’s infinite mercy, the infinite sacrifice of the Mass, the infinite presence of Jesus in the Eucharist and the infinite love of God, which Christians are called to share with others. Angrisano smiles often and always wears a cross. a modern disciple of Christ and uses contemporary Christian music to bring young people closer to God. It is “a pretty upbeat song that talks about allowing God to be part of our lives,” Angrisano said, which is the goal of his music ministry. Pope Benedict XVI, and both diocesan and parish efforts to welcome young people into the life of the Church.